A portion of this book had a previous life in 1990 and in that incarnation it was entitled As Tears Go by. Mark Hodkinson explains in the preface that he was embarrassed about the first biography he wrote and wanted the book to “disappear, fade away”. Marianne Faithfull had disliked the book and described it as “scaly”. The name change I guess is to convey that this is a different book and perhaps the changing of tears to years suggests both the fact that it spans into further decades of Marianne’s life than the first publication and also that it is an attempt to balance out the tears (as in both the salty ones that fall from the eyes and tears as in rips, holes, wounds) with a more positive approach. Having not read the first book it’s impossible to comment on how successful this re-write has been and how much of the text has been altered. He states in his preface that he was given six weeks to revise the original manuscript which turned into six months commenting “I could not fundamentally alter the “shape” of the book or overlay a different narrative but it allowed me to tighten the grammar, excise the fanciful, and most importantly chase away the condescending fool who had possessed my insecure twenty something self” It’s certainly not a crime to be older and wiser and want to set the record straight but it strikes me as a little concerning that the author appears to consider revising and redeeming himself as a writer as the most important impulse here. He goes on to explain how Marianne couldn’t possibly be expected to co-operate/contribute to the book “These days artists offer themselves for interview only when they have a product to promote. The media understands and accepts implicitly that no one is available ‘out of season’ anymore. So, no, she didn’t co-operate.” This simply isn’t always the case though clearly most major artists aren’t going to sit down and spill their guts out to anyone who asks but what I find a little strange is that Hodkinson is a journalist for the Times and though he quotes various interviews conducted with Marianne from other broadsheet journalists it would seem that he has never actually met Faithfull. This doesn’t mean he can’t write a decent book about her but there is a possibility the resulting book will be a series of second hand visions and recycled reportage that may be interesting to read but is unlikely to provide any fresh insight into the book’s subject. And for me, this is just that kind of book. The good news is that with a life as intriguing and dramatic as Marianne’s this is a captivating read. If you are looking for a straightforward documentation of Faithfull’s life in chronological order this is a useful and colourful portrait. Hodkinson has clearly undertaken a lot of research and takes the reader through Marianne’s early years and unusual parentage, her schooling and teenage years that snowball into her prominent place in the Swinging Sixties. An extraordinary array of characters enter the picture, including Paul McCartney and of course the Rolling Stones and just about everyone associated with that revolutionary era. I’m unclear where the original book would have ended but we can safely say the revised edition stretches further into Marianne’s life and brings together details of the remarkable work she has been doing for the past few decades, some sung and some unsung. There are vivid accounts of Marianne’s drug addiction and struggle with her inner demons as well as a constant chalking up of the people she apparently went to bed with. The author also goes into considerable detail concerning her recordings and film career. There are several points in the narrative though, where it isn’t clear where the information is coming from. Although the book has a sizeable index I think it would be illuminating if there were footnotes to identify his sources for some of the story and to reference where some of the quotes are lifted from. Sometimes he states this and sometimes not. For me, at several points, this book cobbles together far too many reviews of Marianne’s work from various publications than necessary, especially towards the latter part of the book where there are literally pages of quotes from reviewers on albums, stage productions and films. I don’t see any great value in this as though it brings together many articles and sound-bites about her work this is material that is widely available online or in print already and there is very little personal comment or analysis by the author himself. I’m glad to report the book ends on a bright note as Marianne’s later years have burst into the brightness of continued creative activity and a hard won respect. She makes it clear that life is for living and loving and freely admits she spent much of her earlier life “unconscious”. This is where the author closes the chapter, quoting from a recent CBS news interview. As Years Go By is intended to be told “straight and journalistically” according to the author and with this intention he achieves what he set out to do. 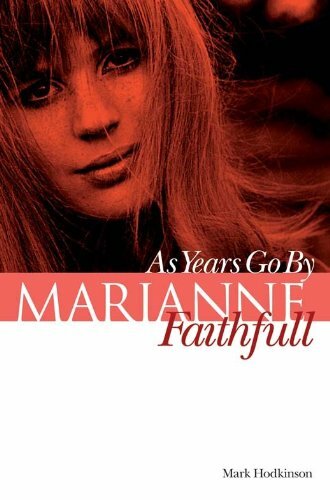 Here you will be able to trace the major moments of Marianne’s life and career and also some more subtle ones but I do feel it lacks a true engagement with its subject and a reliance on other writers and critics opinions. Still, it’s a compelling read outlining a carefully compiled history and probably the only up-to-date chronology of Marianne’s more recent activities available.